So it’s little wonder then that when someone provided this sparkling magic in one little glass bottle, Australians went crazy for it. 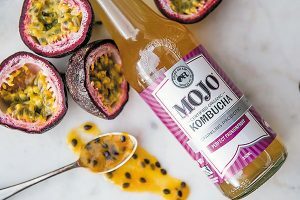 Nestled in Willunga, close to the coast and amongst artisan foodies sits one of the leading producers of a “new wave” health product, MOJO Kombucha. We say “new wave” but during our interview with Andrew Buttery, VP Business Development and Strategy, we discovered that Kombucha predates Christ and can be traced to the Qin Dynasty in China around 200BC. Folklore suggests this fermented drink was favoured by warriors before going into battle. Organic and Raw, the company behind the product, is led by committed health and wellness devotee Anthony Crabb, CEO who with his wife Sarah, partnered with Steve Kirkby and Petra Heeg. 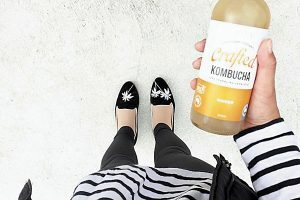 After witnessing the benefits of this fermented drink and seeing the popularity throughout California, the two couples saw an opportunity to create a palatable bottled version that health conscious families could buy on the run. “The product must be kept cold between 1-5˚C at all times to protect the living, good bacteria”, explained Andrew. “We wanted to provide a product for those who already enjoyed its health benefits and were making Kombucha at home.” The team place great focus on supply chain education so that smaller supermarkets and cafes understand the need to keep Kombucha cold. Andrew, former Managing Director of Gemtree Wines, explained how they adapted the homemade product, “We start with an organic SCOBY which is the mother culture for brewing Kombucha. To begin with, Anthony worked from his shed to get the technique right. Through trial and error he gained the confidence to bring this drink to market, selling it out of the back of his car to begin with. His wife Sarah was actively involved in the sales and distribution process as they started to find the right market for their product in health food stores. 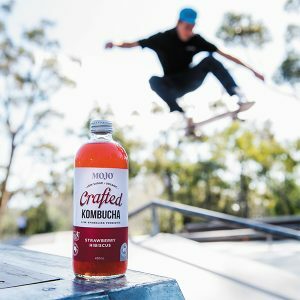 After the natural interest in this bottled fermented drink through health channels, sales grew for the next 4 years to the point Anthony took the big step of commercialising MOJO Kombucha through supermarket channels, commencing with independent grocers including Foodland. Today you can find MOJO in over 2000 outlets nationwide. “We have invested heavily in testing and certifications to reassure consumers that our product is consistently providing the health benefits they expect. Being the first Australian company to commercialise Kombucha, we worked closely with SARDI (South Australian Research and Development Institute) to perfect our processes so we can confidently replicate what we produce day in, day out to ensure food safety standards and guidelines are adhered to. We also hold NASAA Organic Certification and follow traditional recipes and methods. 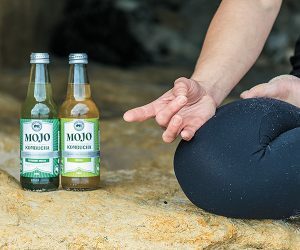 In the last 12 months we have contracted a US provider of Bacillus Coagulans which guarantees that consumers receive a healthy dose of the active ingredients.” MOJO Kombucha can deliver 1 billion organisms, a unique assurance for this brand. Anthony works closely with their food scientist, Charavy Chan, to craft new flavours using organic ingredients, including hibiscus flowers, turmeric, carrot, peppermint, ginger, blueberries and strawberries to name a few. 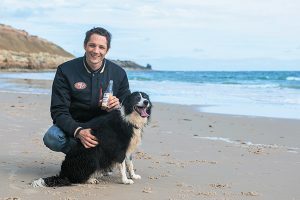 The team of 20 employees share Anthony`s passion as they work together to meet the market demands, selling over 1 million bottles throughout every state and territory in Australia, without losing their family business charm and traditional handcrafted style. So what are the health benefits that make people seek out Kombucha regularly? “Clearly the number one benefit of Kombucha is gut health. The probiotics, organic acids and vitamins balance the gut. This leads to increased balance in the mind and the body and improves brain function.” The positive ingredients combine to make a great vegan and gluten free product which is packaged in a clear glass bottle to showcase the all-natural organic colours. “People are seeking healthy alternatives to soft drinks, juices and sports and energy drinks for their own health and that of their children. The small amount of raw organic sugar required to kick start fermentation is eaten-up through this process.” Andrew clarifies. It is recognised that other Kombucha producers who claim even lower sugar levels are diluting the product and using artificial sweeteners. 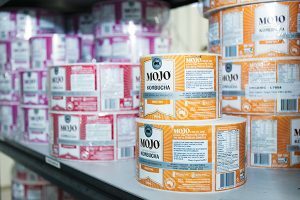 Organic and Raw have also produced a MOJO Crafted Kombucha, designed to be more palatable for those new to the Kombucha taste experience. It makes sense that Anthony chose the name MOJO for his product. “It is synonymous with positive attributes in terms of what it means. If you have ‘MOJO’ you are at the top of your game. MOJO is what the company can deliver to its customers” quipped Andrew. Anthony recommends drinking 1 bottle each day for over-all wellbeing. One of the biggest challenges now for the company will be to ensure that production keeps up with their rapid growth as they maintain leadership in their category and expand into new channels. They seem to be in good hands with a solid board of professionals with high level business skills, providing the foundations and strategic direction for the company to build on.